Fill In Your Details Below To Receive ﻿Your FREE COPY! 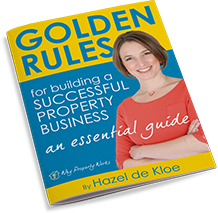 Hazel de Kloe, Leading UK Property Coach and Mentor to over 350 successful property investors, shares with you her Top 24 'Golden Rules' which are a collection of valuable property insights and secrets gathered from working with property for over 20 years. Acclaimed Author and Speaker on the 'Property Circuit', Hazel writes regularly for the UK's top Estate and Letting Agencies and has been asked to feature in Sarah Beeny's 'At Home' Magazine. Get your FREE copy below NOW! How Golden Rule No. 7 alone will save you £1,000's! We hate spam too! Rest assured, we will never share or sell your details with any third party.